You are here: Home » Columnists » What If We Just Said ‘Pray’? The “reform of the reform” is afoot and some folks are none too pleased. How’s that for an understatement?! Yes, you read that correctly. Fr. Michal Ryan, pastor of a cathedral church, launched an online signature drive to encourage laity and clergy alike to oppose the liturgical texts approved by Holy Mother Church, and with the help of a liberal media that also considers liturgy-by-popular-vote a nifty idea, the website now boasts over 22,000 signatures! A few weeks ago Fr. Ryan made news once again for a February 27th homily in which he ostensibly announced a cease-fire; vowing “quiet trust and acceptance” while preparing for the new Missal’s arrival. If true, this would be wonderful news, but the homily itself (which is posted at the Cathedral’s website) raises substantial red flags. If that were not telling enough, he even gave those with ears to hear a not-so-subtle hint of the agenda going forward, saying, “It is the people who will have the last word on the new missal once it is introduced.” So much for “quiet trust” in Holy Mother Church. Oh, and did I mention that his online signature drive continues unabated to this day, adding more than 100 new recruits since he allegedly resigned the offensive? All of this seems to add up to a change in strategy more so than a change of heart, but whatever the case may be with Fr. Ryan, there are certainly others in authority in our parishes that are determined to infect the faithful with their personal biases against the forthcoming translation; e.g., the vocal minority of recalcitrant clerics in Ireland and Australia that have recently been in the news. As I wrote in a previous column, I sincerely believe that the majority of Catholics, like me, actually welcome the “reform of the reform,” we applaud the bishops for their work on the new translation and we want to encourage them as they attempt to shepherd the faithful more deeply into the Sacred Mysteries being celebrated at Holy Mass. We know the process of implementing the new Missal will not be easy, but we trust that it will be well worth the effort. Hey, maybe Fr. Ryan was on to something! What if we just said pray with us for the humility we need to receive from Holy Mother Church and not to dictate to Her; to lead according to Her will and not our own opinions; to serve and not to be served. What if we were to let the world know that we — the all-too-silent majority of Catholics — appreciate the bishops’ efforts as a step in the right direction and we joyfully welcome the forthcoming sacred texts? 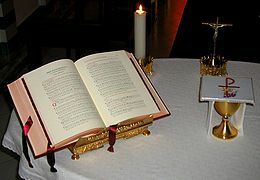 What if we made a solemn commitment to pray for the conversion of those who oppose Holy Mother Church; that they may come to humility so that the important work of preparing the way for the Roman Missal can proceed in peace? If you think the idea has merit and if you’re willing to join me in pledging your prayers of intercession for all who are struggling to embrace the new Missal, then I invite you to log on to the website www.whatifwejustsaidpray.org to make your voices heard. If our bishops are made aware of our faithful solidarity perhaps they will feel strengthened in their Divinely-given ministry of teaching, sanctifying and governing the People of God to the glory of His name. Can we lift up our bishops by showing them that we appreciate their efforts to restore a sense of the sacred at Holy Mass? Can our collective commitment to pray for those who oppose Holy Mother Church aid in facilitating their conversion? Can we exceed 22,000 signatures? I would certainly like to think that we are the faithful majority, but in any event, it’s sure going to be fun finding out!